Topical BioMedics—the formulators of Topricin—is helping doctors and patients have more options and better tools to create improved treatment protocols for gout and other ailments. It now offers help to those who suffer with gout with its “Get Gout Relief” initiative, whereby the company will send consumers a free 2 oz. tube of Topricin Foot Therapy Cream ($16.95 value) when they receive a register receipt showing the purchase of a 4 oz. jar of Topricin® Foot Therapy Cream from CVS or Walgreens. More than 8 million Americans suffer with gout—a painful form of arthritis that causes swollen, red, hot, stiff joints. Topical BioMedics now offers help to those who suffer with this ailment with its “Get Gout Relief” initiative. The company will send consumers a free 2 oz. tube of Topricin Foot Therapy Cream ($16.95 value) when they receive a register receipt showing the purchase of a 4 oz. 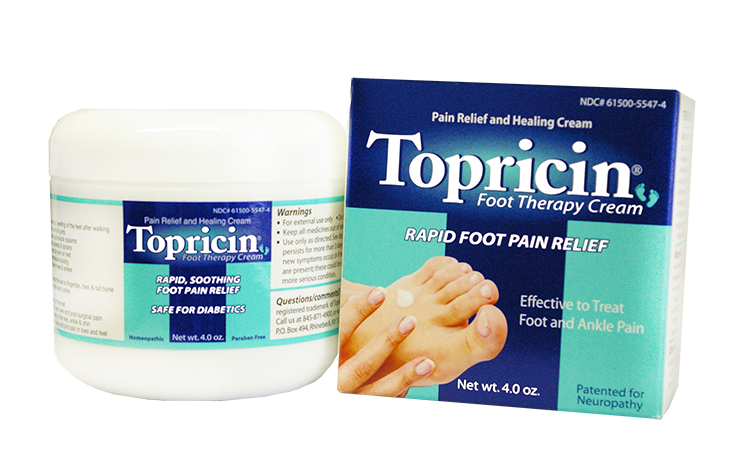 jar of Topricin® Foot Therapy Cream from CVS or Walgreens. The product can be found in the Foot Care Section at CVS and the Diabetic Section of Walgreens. To receive their free 2 oz. tube of Topricin Foot Therapy Cream—the perfect size for carrying in purse, pocket, backpack, or brief case—consumers simply mail their CVS/Walgreens receipt showing they’ve purchased a 4 oz. jar of Topricin Foot Therapy Cream to: Topical BioMedics, Inc., 6565 Spring Brook Avenue, PMB #207, Rhinebeck, NY 12572. Or they may scan the receipt and email it to specialoffer@topricin.com, along with their name and shipping address. While prescription drugs are standard protocol for treating gout, Topical BioMedics—the formulators of Topricin—is helping doctors and patients have more options and better tools to create improved treatment protocols. This includes education of factors that are at the root cause of these painful ailments, thus empowering both the doctor and the patient and contributing to a true patient-centered outcomes model and a sustainable health care model. Topricin Foot Therapy Cream offers relief from gout pain and eliminates risks of organ damage by significantly reducing the need for OTC and Rx medications and, in some instances, has been shown to eliminate their use all together. But even if the need for Rx drugs cannot be eliminated, Topricin can minimize the amount used, and the side effects, which is a dramatic and significant benefit to the person suffering with gout. The Topricin approach provides a balance of intelligent holistic and conventional medical protocols. How it works: Topricin is a combination biomedicine pain relief and healing cream technology the helps to balance metabolic healing functions where it is applied at the site of pain. The first action: detoxify the inflamed tissue deep in the pain site, stimulating the draining of excess fluids and toxins through lymphatic system. This action takes pressure off the micro-capillaries, restoring oxygen-rich blood flow to damaged cells. By reduce any buildup of toxins and excess uric acid or other waste byproducts from the pain site, there is a restoring of oxygen levels to the cells, maximizes the healing of damage cells. Pain relief is the result of healing the cells causing the pain. 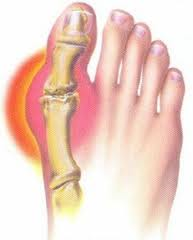 Gout results when uric acid levels get too high in the body and crystallize in connective tissue, in the joint space between two bones, or in both. Initial symptoms usually consist of intense episodes of painful swelling in single joints, most often in the feet (especially the big toe). It can also attack ankles, heels, knees, wrists, fingers, and elbows. The reason for the severe pain: if you were to look at uric acid when it crystallizes, you will see it resembles needle-like shards of glass. 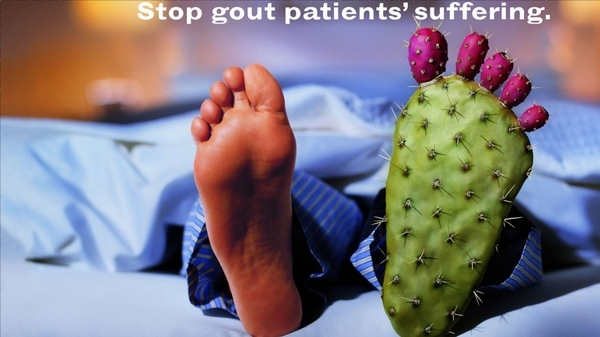 Gout is a metabolic disorder that grows more serious over time. Men, particularly those between the ages of 40 and 50, are more likely to develop gout than women. At first, attacks usually get better in days. As time goes on the attacks last longer, happen more frequently, and eventually may cause permanent damage in fingers, knees, and other affected joints, disabling the individual who suffers with it. Left untreated, over 90% of cases recur for life. Risk factors for gout include being overweight or obese, hypertension, alcohol intake (especially beer and spirits), diuretic use, and a diet centered on meat, seafood, and other purine-rich foods. Gout occurs when the body can no longer breakdown purines—which build up in your body and elevates uric acid levels as uric acid is a waste product of purines. Although purines are naturally found in the body's tissues, the problem of elevated uric acid levels is directly linked to the over consumption purine-rich foods. When your body digests purine, it produces uric acid that normally dissolves in the blood, passes harmlessly through the kidneys, then out of the body in urine. When uric acid levels build up they form the painful, needle-like crystals, which can also cause kidney stones, as well. The impact of gout on your life and daily routine can be severe and disruptive physically as well as emotionally. Ignored or improperly treated, gout may eventually cause other, more serious medical conditions. Treatments for gout often default to prescription drugs that do not address the metabolic cause of the gout. Worse, they cause other imbalances, compromise the healing process and other functional organs in the body, especially the liver and kidneys. Over-the-counter chemical-based pain relievers ibuprofen, acetaminophen, or naproxen are not good solutions, for the same reasons—they do not address the fundamental metabolic issues that are causing the gout and cause toxicity in the liver, kidneys and gastrointestinal tract, increasing the risks for organ failure, heart attack and stroke. It is not uncommon for gout sufferers to be prescribed one of a number of pharmaceuticals to address their gout. These may temporary relief of symptoms; however their side effect profiles are significant. Allopurinol – generic name (brand name Zyloprim®*, Aloprim®**). Side effects include rashes, drowsiness, and disorientation, and it can have adverse reactions with other medications, particularly blood thinners and diuretics. Allopurinol should not be taken by patients with poor kidney or liver function. Febuxostat – generic name (brand name Uloric®***). The most commonly reported adverse events in clinical trials were liver function abnormalities, nausea, rash, and joint pain. Probenecid – generic name and Sulfinpyrazone – generic name. May cause adverse interactions with other drugs or complications with existing ailments such as blood disorders, ulcers, and kidney problems. Pegloticase – generic name (brand name Krystexxa****). Is given intravenously and changes uric acid into another form. A quarter of the patients who participated in the clinical trials experienced a severe allergic reaction to the drug. Healthcare providers pretreat patients with an antihistamine, acetaminophen, and a corticosteroid to reduce the risk of an allergic reaction. Given the severity of side effects, it is unfortunate that many people who experience recurring gout attacks are usually advised to remain on these drugs to prevent further attacks and all because they weren’t first made aware of all their options. --Limit or avoid purine-rich foods. Animal proteins are high in purine,including organ meats, red meat (beef, and lamb), pork, fatty fish and seafood (tuna, shrimp, lobster and scallops, herring, anchovies, and mackerel). --Cut back on fat. Saturated fat lowers the body's ability to eliminate uric acid. --Limit or avoid foods sweetened with high-fructose corn syrup. Fructose is known to increase uric acid. --Limit or avoid alcohol. Alcohol interferes with the elimination of uric acid from your body. Drinking beer, in particular, has been linked to gout attacks. Avoid spirits as well (wine does not seem to affect uric acid levels). --Consume low-fat dairy products. Low-fat milk and yogurt have been known to reduce gout episodes. --Drink plenty of fluids, particularly water. --Add lemon juice to your water. Lemon is good for the liver, and citric acid will reduce the levels of uric acid. --Exercise and lose weight. Both have been shown to lower the risk for gout. An anti-inflammatory that is more powerful than cortisone. Turmeric root safely reduces inflammation and pain from gout in fingers and other joints during attacks. An alkalinizing substance that balances blood pH, helps keep uric acid crystals from forming, and ensures that uric acid stays dissolved as it is passes through the system. Naturally occurring, bicarbonate of soda is found in many mineral springs. A powerful antioxidant that helps strengthen the liver and kidneys by stimulating protein synthesis in their cells. Promotes excretion of metabolic waste and uric acid crystals in urine without diuretic effects. This is extremely important as many uric acid flushes jeopardize the patient's risk of getting kidney stones. Can prevent pain and inflammation in the body before it starts. This is a substance you do not want to miss out on when suffering from a gout attack. A well-studied pain and inflammation fighter, Devil's Claw is thought to reduce pain much the way prescription Cox-2 inhibitors such Celebrex work (Devils Claw actually balances Cox-1 and Cox-2). One of the richest sources of anthocyanins, tart cherries have been scientifically shown to dramatically lower uric acid and fight gout attacks. One study followed 633 Gout patients for a year and showed that those who consumed tart cherries over a two-day period had a 35% lowered risk of gout attack. The study also confirmed that more cherries were definitely better, as patients who consumed three times as many cherries experienced a 50% reduction in risk. These are exceptional results, especially considering that this study only looked at people eating ½ a cup (about 10-12 cherries) and did not include people who take powerful extracts like Uricaid, a potent liquid extract that contains the equivalent of hundreds of cherries in each dose. Always be mindful if you are taking prescription medications be sure to let your doctor know if you are doing any other self-help treatments. Additionally work with the doctor or pharmacist with the goal or reducing or possibly eliminating these medications. John DeMare, a golf buddy who also suffers from gout and uses Topricin to help manage it, recommended it to Dr. Martin. “Before I used Topricin, I would have to take my prescription for three or four days before getting any relief,” Dr. Martin says. “During the past couple of years at the first twinge I take one Rx pill and slather Topricin on a few times a day. It’s allowed me to cut way back on my medicine. Lou Paradise, president and chief of research of Topical BioMedics and the inventor of Topricin formulas, says, “Gout responds very well to diet and lifestyle changes, as well as incorporating Topricin into a patient’s regime. Always be mindful if you are taking prescription medications and be sure to let your doctor know if you are doing any other self-help treatments. Additionally work with the doctor or pharmacist with the goal or reducing or possibly eliminating these medications. American families upside down and is undermining the very fabric of our country. ***Teijin Limited/Takeda Pharmaceuticals U.S.A., Inc.
**** Manufactured by DSM Pharmaceuticals, Inc. for Prometheus Laboratories Inc.